If you’re a Hyatt loyalist with their co-branded credit card, then chances are that you receive a fair number of Category 1-4 free night certificates. While I generally find these certificates to be useful, in this post I wanted to cover what was probably my favorite use of one of these ever. The World of Hyatt Credit Card was recently introduced, and it offers a Category 1-4 free night certificate on the account anniversary every year. You also have the opportunity to earn a second Category 1-4 free night certificate when you spend $15,000 on the card in a cardmember anniversary year. On top of that, the card can help you earn elite nights towards status, so you receive a further Category 1-4 free night certificate when you qualify for Explorist status, and then you receive a Category 1-7 free night certificate when you qualify for Globalist status. In other words, if you’re someone who qualifies for Globalist status every year and spends at least $15,000 per year on The World of Hyatt Credit Card, you’re earning at least three of these certificates per year, plus a Category 1-7 certificate. How valuable are Category 1-4 free night certificates? While Hyatt’s best hotels will be in Categories 5, 6, and 7, Categories 1-4 cover a vast majority of Hyatt’s global footprint. Generally speaking the points category a hotel is in is related to their average occupancy and nightly rates, so these certificates won’t be valid at the Park Hyatt Paris, Park Hyatt Sydney, etc. The good news is that these certificates are good for more than just Hyatt Place properties. For example, just a couple of days ago I redeemed a Category 1-4 certificate for an upcoming stay at the Hyatt Centric Miami South Beach, where the paid rate would be around $400 including taxes and fees. 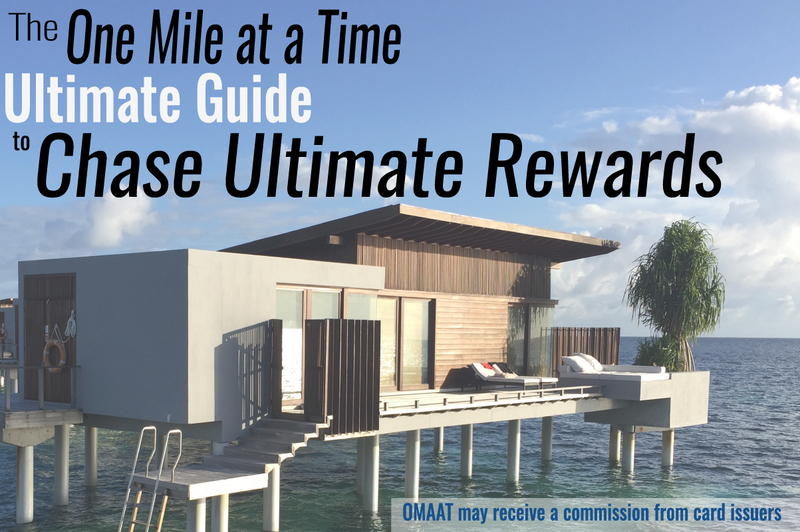 Redeeming a free night certificate from The World of Hyatt Credit Card is an exceptional value. This is a great use of the certificate, and while I’m looking forward to the stay, I’m not expecting the Hyatt Centric to be amazing or especially luxurious. After all, you’re paying for the location. That brings me to my most memorable Category 1-4 redemption. Before I get into the details of this specific stay, let me say that I think a majority of my firsthand perception of loyalty programs is based on peak experiences. In other words, 20 one night stays at airport Hyatt hotels will do very little to make me feel loyal to the Hyatt brand as a Globalist member, because all I’m hoping to get out of the stay is a place to sleep with fast wifi. A majority of my perception of loyalty programs is based on those few stays that matter most to me. For example, after recent stays at the Park Hyatt Paris and Park Hyatt Milan, my perception of World of Hyatt has improved by so much. 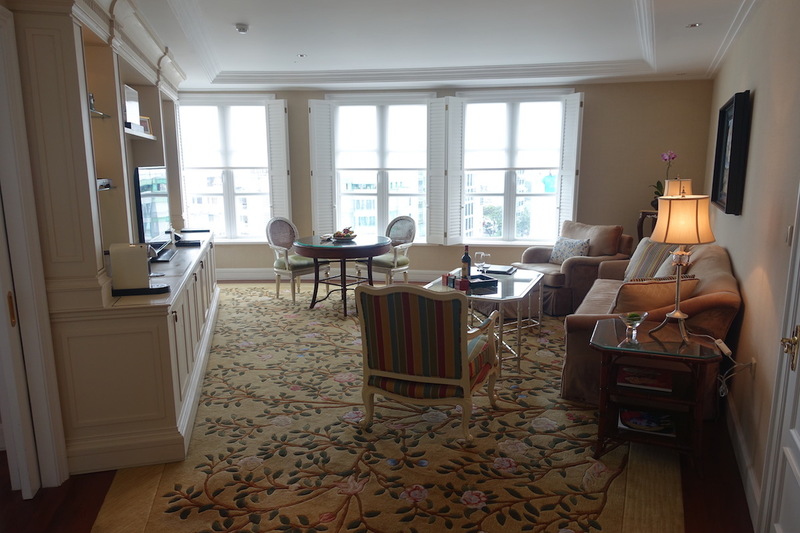 I was able to redeem points and confirm suite upgrades at the time of booking, and both hotels were spectacular. That goes a long way towards making me feel rewarded for my loyalty. While this wasn’t quite one of those stays, this brings me to my stay at the Park Hyatt Saigon last October. It was my first time staying at the hotel, and I only stayed for one night using a Category 1-4 certificate. The hotel is a Category 4 property, and a paid stay would have cost about $400. 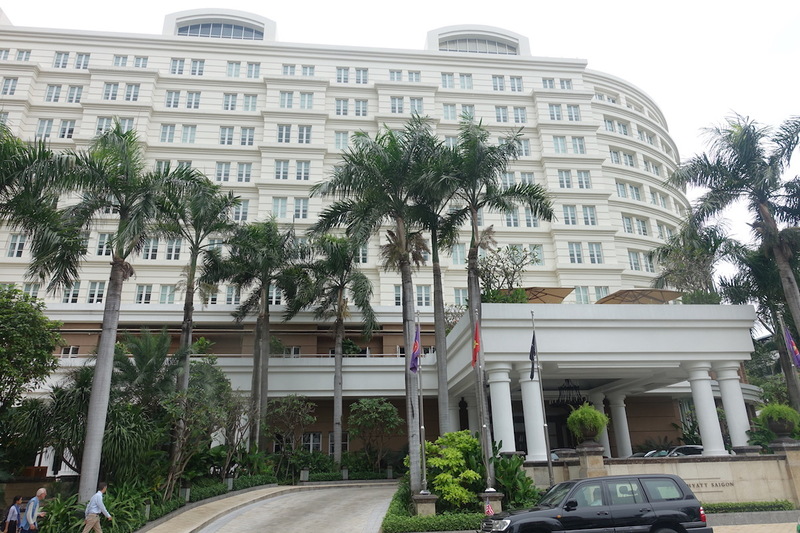 I loved the Park Hyatt Saigon. While most Park Hyatts have modern minimalist decor (which I like as well), this property has French Colonial decor (which is fitting of the place), while still having all the modern amenities you’d expect. 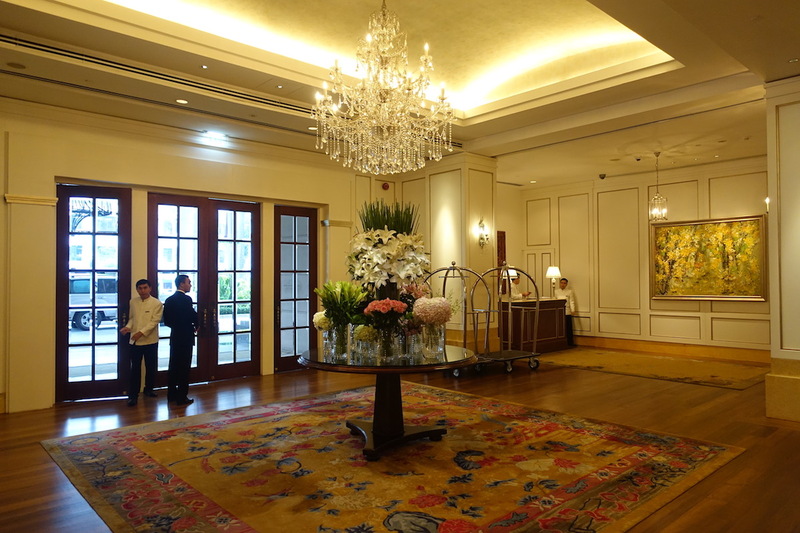 The lobby was beautiful, with fresh floral arrangements. Even though we arrived before check-in time, we were able to check-in early, and were able to take advantage of Globalist 4PM check-out the next day, so we stayed for about 30 hours. Upon checking in we were invited to have a welcome drink in the spacious lobby bar. I had a cappuccino and Ford had fresh coconut juice. As a Globalist member, I got an upgrade to a beautiful suite, with a welcome amenity of red wine and some dried fruit. It had been a very long week of travel and we had work to do and wanted to take a nap, so when we arrived we ordered some delicious Vietnamese food through room service. The following morning we had our complimentary Globalist breakfast in the restaurant, which had a massive selection of high-quality options. The service throughout the hotel was excellent as well. Usually, my most memorable stays are longer ones where I confirm a suite upgrade in advance, but for whatever reason, this one night stay was one of my most memorable Hyatt stays of last year. 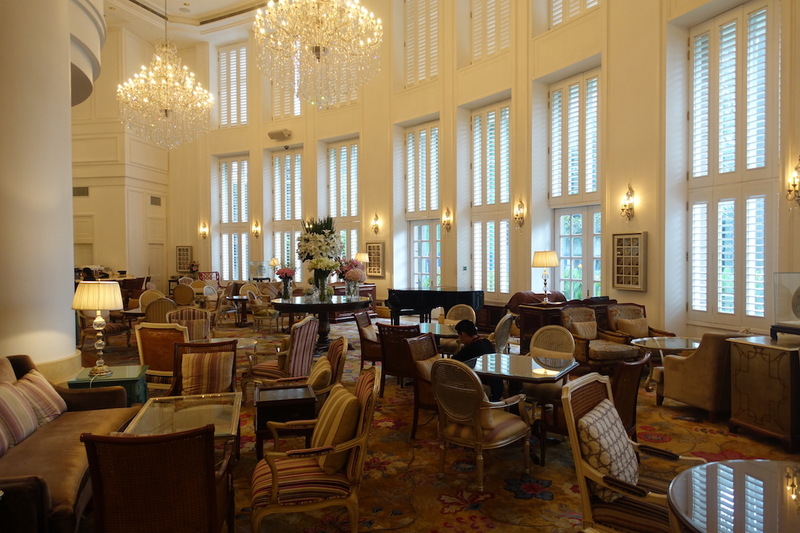 I loved the decor of the Park Hyatt Saigon, we got a great upgrade, and we really maximized our one night stay here. I’d argue the combination of Globalist status and The World of Hyatt Credit Card are more useful than ever before, given that you can now redeem Globalist confirmed suite upgrades on award stays, and all nights now count towards status, including those booked with free night awards. On top of that, with Hyatt’s credit card you can now earn elite nights towards status, which makes it easier to earn Globalist status. What has been your favorite use of a Hyatt Category 1-4 free night certificate? Happen to be going to Boston for a weekend; surprised to see Hyatt Regency Boston showing the availability and booked it right away (which is now faring at $370 /night). I stayed there for three nights in December and loved the hotel (and city). 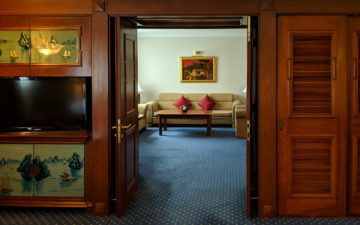 I’m not a Globalist, so no suite, but my room was very comfortable nonetheless. Service, decor and location were all excellent. I would gladly return and highly recommend it to others. Park Hyatt Hamburg is also a category 4. Stayed there this spring with no status and had a much better experience and service than I did at the Conrad Hong Kong as a Diamond a few months before. 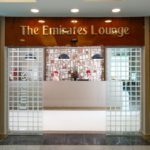 It’s not hard to get $300+ in value from the Category 1-4 certificates, and when the value of the certificates earned from spending is factored into the bonus points earned from spending (1X, 2X categories), the return for spending on the WOH card is very good…if the Hyatt footprint works for you. Hey Lucky, I stayed at the Hyatt Centric Miami South Beach last December after Christmas. Rooms were going for $700 and I was able to use 15,000 points a night for 3 nights. I thought the rooms were very nice and sleek, but the hotel is defintely basic. The third floor is a combined check in area/restaurant/bar with the hotel pool on the outside, that is pretty much all there is. I dont think there is even a gym there. Like you said, it is all about the location. It was great to go out and walk to the bars and beach, and I had a very nice time. Grand Hyatt Beijing category 4, I was upgraded to the club , which in my opinion was the best of all Hyatt’s I have stayed at,multiple food choices and self serve items-plus made to order items. Stayed here over New Years. Used a globalist suite upgrade. The biggest benefit to this hotel is that it’s an oasis of calm in a chaotic city. The suite was really nice (though nowhere near as nice as Siem Reap). The globalist breakfast was meh as the food was subpar to the street food. Redeemed earlier today, a weekend night stay at the Grand Hyatt Berlin for mid-August. As someone who doesn’t stay at Hyatts much (footprint doesn’t work for me, and also SPG Platinum + Hilton Diamond), its hard for me to see why I should upgrade from my current Hyatt CC to the WoH CC. A higher annual fee, and I’ve moved my travel spend from my Hyatt card to the CSR. Is there a benefit I’m missing? 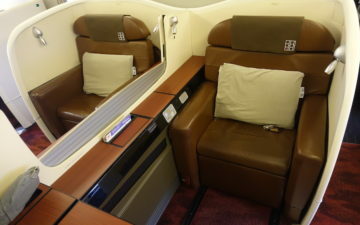 Should I upgrade and move some of my airline spend to the WoH CC? Just used 2 certs for 2 nights at Hyatt Regency Coconut Point Resort and Spa. It was an amazing resort (had 3 pools, lazy river, 3 waterslides, private beach, bonfires, 2 restaurants, etc.). Can’t wait to go back next year when my wife and I get our next set of free night certs. Planning to use mine at Hyatt Centric Santiago in Chile. I wasn’t aware there was a $400/night hotel in all of Ho Chi Minh City. Sounds vastly overpriced for a cash stay. I dont think it’s wotth $400 / night but it’s a good use of points or a free certificate. Why are y messages censored? Park Hyatt Busan was great, although a little out of the way. May or may not have gotten an upgrade as Diamond at the time, but great room and view. Hyatt Regency Danang is fantastic with almost dinner served in the lounge and great beach. Likely got a Diamond upgrade; the room was really nice. Hyatt Regency Tokyo is certainly worth staying for free or 12K points and also has almost dinner in the lounge. No upgrade. The Busan and Danang were memorable, the Tokyo is just a decent use of free nights. @Sharon As a category 4 property, I think Grand Hyatt Taipei is much better than the Grand Hyatt Beijing, in terms of location and services. Andaz Papagayo is excellent use of free night cert. 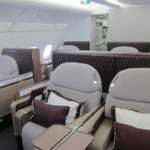 The $15K spend would yield 75K MR points from Amex Platinum. Isn’t that superior to a 1-4 cert? @ Kirk Benson — Sorry, I don’t follow your math as to how $15,000 of spend yields $75,000 Membership Rewards points? 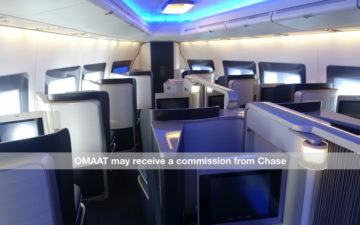 Only airfare purchased directly from airlines and hotels booked through Amex Travel earn 5x points. Hyatt at Olive 8 is the go to for me. I am redeeming mine this year this coming week at the Hyatt Regency Hangzhou. 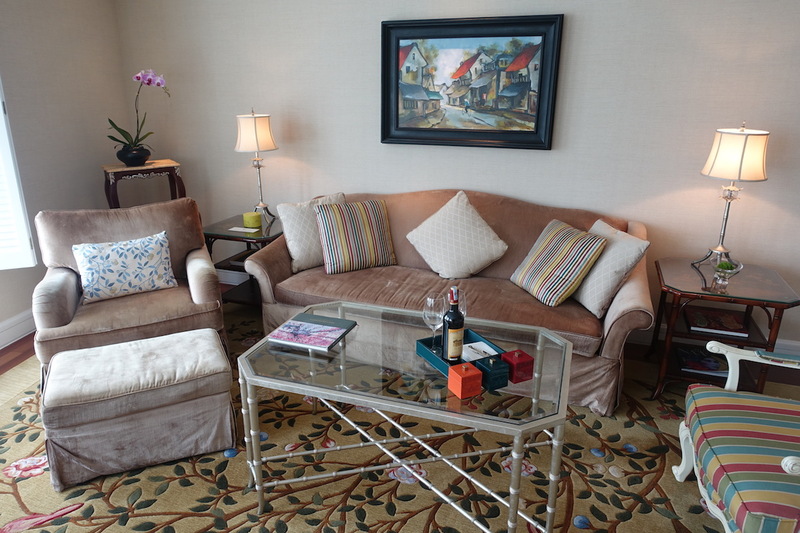 Unbeatable position overlooking the West Lake, and rooms that go for $250+ per night. Great use indeed. Back in May we redeemed our free night certificate and 30k points for three nights at the PH Saigon. It’s classy, sophisticated and elegant, yet thankfully unpretentious. The redemptions offer a tremendous value. The staff were gracious (especially with our toddler) and the property is very appealing inside and out. Food & bev were very good and the beautiful pool is especially noteworthy. Others will say that there are nicer, more authentic properties in Saigon. Whether that’s true or not I’ll probably never know. However, for me, this was one of the nicest city hotels in the world that I’ve ever experienced. Add to that the outsized value, and you have something truly special. Park Hyatt Saigon is always my choice of redemption for my annual free night cert. I love it there! I’m redeeming my free night certificate at the Hyatt Regency in Vancouver BC in September. Used it at the same hotel last year and am happy to return as it’s a beautiful modern hotel in a fantastic location. Least expensive room (member rate / advance purchase) is $545 CAD. I love Andaz Papagayo for the value of the redemption. We visited last January when the prevailing rate was $575/night. Great deal. Using mine at the Hyatt Centric Miami in 3 weeks on a few day layover coming back from teh Caribbean. I hope your review is posted by then! 2 properties I found with great value at CAT 4 as a top tier member were the Hyatt Regency TST Hong Kong and the Grand Hyatt Berlin.